As an event marketer, you know how expensive and challenging it is to execute a flawless experience. At the end of the day, you want to see a return-on-investment. That’s where the right video event marketing tactics can have a major impact. More than 50% of consumers want to see videos from brands over any other type of content, and 81% of businesses use video as a marketing tool. Have you slept on the video marketing trend? No worries. It’s not too late to jump on board. We’re here to help you maximize your event through video. By planning out a variety of content to share before, during, and after your event, you’ll be able to engage with your audience in a new and exciting way. Before you begin filming content, you first need to determine the type of videos you want to create, what purpose they will serve, and how you will share them. Like all things marketing related, there are best practices to consider when planning video content. If you’re looking to create a video campaign promoting a product or service for your social channels, it’s good to keep your content short and sweet since you won’t have your audience’s attention for long. A video that lives on your website and explains your company’s history — you’ll need more time to tell that story, so your presentation can be lengthier. We’ve created a list of event videos that you can use during every stage of the process — from event promotion to event highlights. With video creation, there is plenty of room to be scrappy. Start by sitting down and planning out a shot list. If you’re looking to create a hero video that showcases the entire event or experience, but know you’ll want a few great 10 second clips for social, what shots do you need to get? You can’t rely on being able to pull out shorter clips that will tell a cohesive story — you’ll need to really sit down and document the specific shots you need to make sure you get the most out of your video production efforts. There’s nothing like the anticipation leading up to a big event. How well you build up your audience beforehand will determine your event turnout. That’s why your video event marketing should start long before the actual day of your event. Not only is video creation more cost-effective than ever before thanks to high-quality cameras on your smartphone, but it’s also the medium reaching the most people. Establish excitement around your event and show attendees what they can expect by sharing your message in a promo video. You can use clips from previous events to create a highlight reel that will excite your audience and drive ticket sales. Then share it on your website, social pages, and in emails to spread the word. The mere mention of the word “video” in your subject line increases open rates by 19%, and with the impressive video you will have made, you’re sure to attract a huge turnout. Your event’s speakers are the stars of the show – spread the word and use their street cred to amp up excitement and get people talking. Video is a great way to promote presenters. It’s a versatile tool that gives speakers a platform to share who they are and what they’ll be talking about at the event. This face time can help them establish a personal connection with attendees and create enthusiasm around their sessions. So many people – both young and old – are spending time engaging on social media, especially on Instagram Stories. Try teaming up with one of your most anticipated speakers for event promotion on this platform. Let them hop on your account for a ‘take over’ to keep your audience involved and build excitement around their presentation. Exclusivity through video is another great way to garner attention. Giving your audience a behind-the-scenes look at what it takes to prep for a presentation or sharing a spotlight interview with a popular influencer are just some examples of how you can use video to endorse your speakers. You have chosen speakers for your event because you believe what they have to say about a particular topic is valuable. Make sure you get the most out of their expertise by conducting video interviews with them that you can use on your blog or website. Take HubSpot for example. 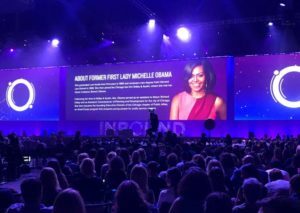 Every year, they host INBOUND, an annual marketing event with big-name guests like Michelle Obama and Alex Rodriguez. While nearly 25,000 attendees show up to their event in Boston every year, 3 million people tune in every month to their studio videos, which showcase speakers in a more authentic and inclusive way. Not only do these videos engage an audience, but they also continue to build awareness and excitement around INBOUND. No matter how you choose to endorse your speakers, you can use this content in so many ways. Share it in an event kickoff, on your event app, and even play it at the event to introduce thought leaders before they take the stage. With best practices for video and social media evolving all the time, it can be difficult to know how you can incorporate both in your marketing strategy. Thankfully, live streaming has been introduced to Facebook and Instagram, giving you a platform to present information in a more casual way. Live video draws longer streams and higher engagement rates than video-on-demand. You can stream interviews, presentations, and behind-the-scenes happenings while also responding to viewers’ comments and questions. Not only does it give viewers an exclusive look at your event, but it also allows you to get your message across to people who can’t physically be in the room. This will help spread your message and set you up for future ticket sales. Sixty-seven percent of audiences who watched a live stream would purchase a ticket to a similar event the next time it occurred. Remember your careful video-capture planning? Now is where it pays off. Get more bang for your event budget buck by making sure you capture footage you can use long after the doors close. During the event, you should be shooting content to use in your follow-ups and future promotions. Whether you shoot video that features interviews, case studies, or authentic attendee testimonials, all of that footage can be used to create a highlight reel recapping the success of your event. Share it on social with your branded event hashtag to reach event-goers after the fact – chances are they’ll share it with their followers too. Content that is specific and relatable to your audience has an 83% chance of being shared, which means even more people will know about your event than ever before. In the months leading up to your event, video can help drive awareness, encourage registrations, and build excitement. During your event, it can help introduce speakers and engage with people beyond the room. And afterward, it can keep the buzz alive and promote your brand and next year’s event. Contact us to talk more about integrating video into your event strategy. We received your request for “5 Must-Do Strategies for Using Video at Your Next Big Event”.